SSL certificates are relatively cheap to purchase, but sometimes it would be easier if you could create your own. You might need to setup SSL on development and test servers that have different host names or on systems that will only ever be accessed on your local network. 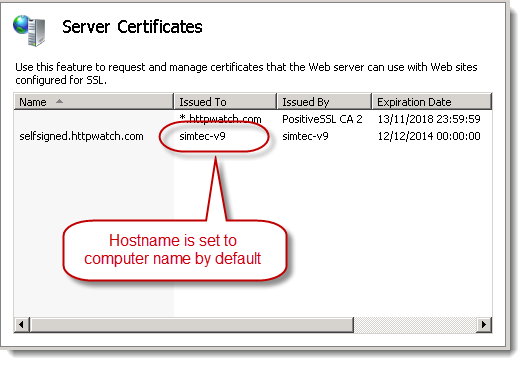 Self-signed SSL certificates allow you to quickly create certificates for free, without having to pay a Certificate Authority (CA) or comply with any auditing requirements. 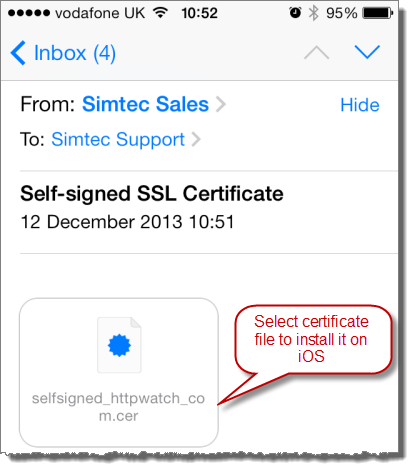 The rest of this post provides tips on how to setup iOS to avoid these errors and how to simplify the creation and management of self signed certificates. 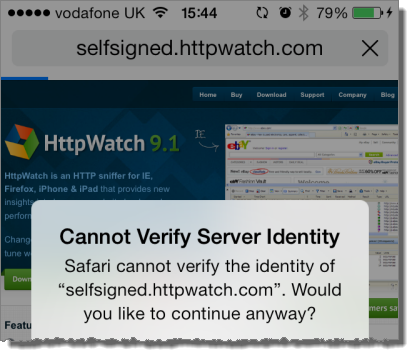 Accepting the certificate in Safari just adds an SSL exception that prevents Safari warning you about the site. 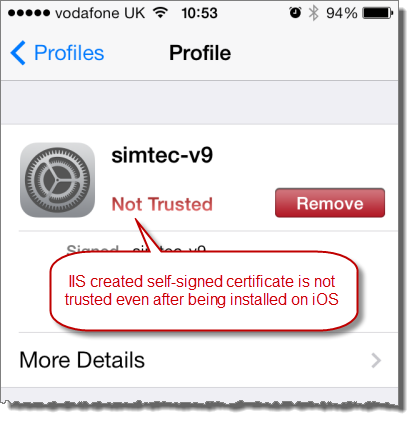 It doesn’t install the certificate as a trusted certificate on iOS. Any other apps (e.g. Chrome, HttpWatch, etc…) on the device will still fail to connect to the site. 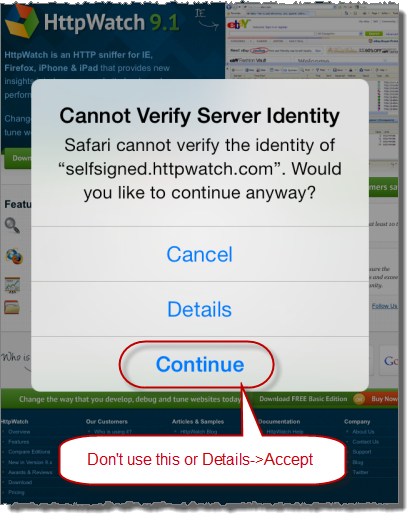 Once the SSL exception is added there doesn’t seem to be a way to remove it in iOS 7. In previous versions going to Settings->Safari and selecting ‘Clear Cookies and Data’ would delete it. This no longer seems to work in iOS 7 (please leave a comment if you know how to do this). Then select Install to add the certificate. Once you’ve done this you use the certificate without warnings in Safari or other iOS apps that use the device’s keychain..
Apple provides an iPhone configuration utility for Mac and PC that can also install certificates. This would be a better option where email is not available or you have a larger number of iOS devices to manage. It’s possible to fix this problem by installing and running the SelfSSL tool from the IIS 6 Toolkit. However, it’s probably easier just to use OpenSSL as described in the next tip. One of the easiest ways of creating a self-signed certificate is to use the OpenSSL command line tool that is available on most platforms and installed by default on Mac OSX. You can use any filenames you like for the key and certificate (.cer) files. The /CN parameter needs to be set to the required hostname (e.g. for https://www.mysite.com in the example above). The days parameter specifies the expiration date as days from today’s date. There’s even a site to do this if you don’t feel like downloading OpenSSL, but of course it’s more secure to do it yourself. 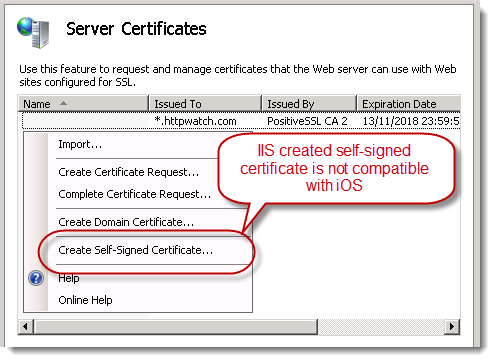 One problem with self-signed certificates is that you’ll need to set up trust relationships for each certificate on each device. An alternative is to create your own Certificate Authority (CA) root certificate and then create certificates based on it. 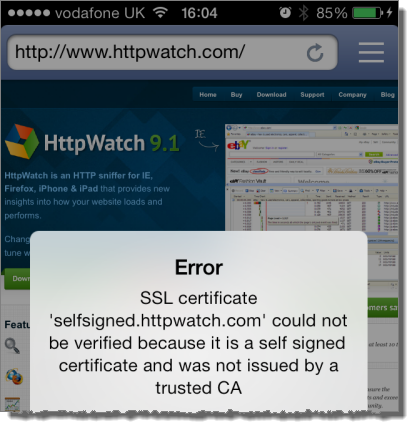 Instead of paying a commercial CA to create SSL certificates on your behalf, you are acting as your own CA. 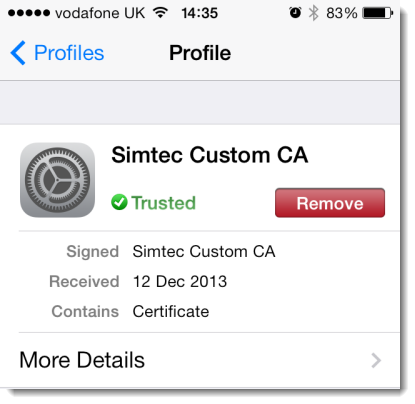 The advantage is that your custom CA certificate only has to be installed once on each device. The devices will then automatically trust any certificates you issue based on your root CA certificate. The private key file (myCA.key) is only used when creating new SSL certificates. You can create as many certificates as you like based on this CA certificate. There’s an extra step involved because you have to create a CSR (Client Signing Request) as if you were purchasing a commercial SSL certificate. The certificate created (mycert.cer) can be installed on a web server and accessed from any iOS device that already has the CA certificate installed. 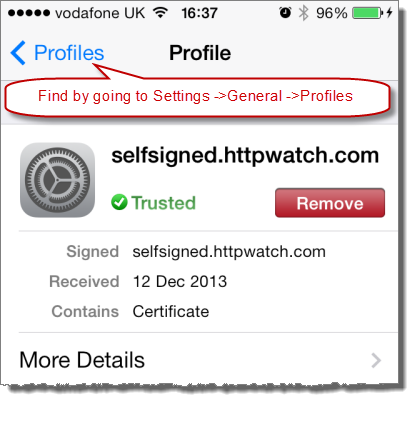 To remove the SSL exception on Safari on iOS 7.0.4 you can reset all settings (General > Reset > Reset Settings). Unfortunately it deletes all your settings (go figure); but its one huge step better then a full restore and you lose your text messages. Thanks a bunch! Your tip #4 really helped me out. I couldn’t get the IIS-Manager-exported .cer file to install on an Android device. Doing the whole thing through openssl (not using IIS Manager) got it all working correctly, including on Android. Thanks for the tutorial. It took me several hours to solve the issue. Thanks! I create at #tip5 and all work fine. But I need add this one to Font mobileconfig create from Apple Configurator. The message still say ‘Not Signed’ or ‘Not-Verified’. Thank you so much for this post. I would add now the additional param of -sha256 when creating the certs to avoid the SHA-1 warning on browsers. Thanks for the tip. The blog post has been updated. How do I get the .pem files from this? it means I must isntall .cer into iphone to trust that I can acess to another web of this host?